to Creating a Profitable Embroidery Business Quickly! Working with a coach Step by Step and getting the embroidery business guidance through each phase of your business is one of the fastest ways to achieve the results and benefits that you are looking for in your embroidery business. Working with a Coach will give you the advantage of learning the business quickly with fewer errors along the way and you will see a return on your investment much sooner! My job is to inspire you and help you in whatever capacity that you need in your journey to learning how to run your embroidery business and make the profit that you are looking for. Even though there will be challenging times, I want you to have fun along the way and enjoy your business. You should feel inspired, motivated, challenged, and empowered to move your business in the right direction. I like to start clients right out on my Embroidery Video Training website. This gives you the fundamentals of how to embroider along with a lot of short cuts to make it easier for you. I also recommend that you purchase the Embroidery Business Guide,The Truth About Embroidery Business Success This embroidery business guide is designed to help you run your embroidery business. If you are brand new to embroidery, I recommend starting with my program, How To Start An Embroidery Business. This program is designed specifically for the brand new embroiderer or the embroiderer that has been creating projects at home for friends and family and now wants to start a business! I have many other programs that are available to help you in other areas of your business and I also offer one on one embroidery business guidance to private clients. I want to help you move forward in your business and with my embroidery business guidance, you can move forward in the fastest and most efficient way possible. To become an expert in this business is going to require some time and effort on your part but with my step by step embroidery business guidance, it is a goal that you too can achieve! 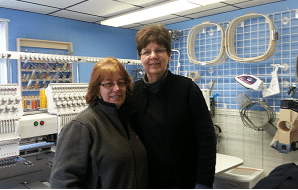 Do You Already Have A Business And Need Some Personal Embroidery Business Guidance? You may be the person that already has a business started but needs some help with learning how to create the quality embroidery work that seems to be so frustrating to you, or maybe you are the embroiderer that is not seeing the profit that you want to achieve in your business. Whatever your situation is with your embroidery business, I can help you and with my embroidery business guidance, you can move onto the right path faster! I have a few limited spots available for personal coaching but before I take on a client for personal coaching, I require that you fill out an application. I need to know as much as possible about you and your business before we start so that I will know exactly how I can help you reach your goals and expectations. Sometimes after going over the application, I can simply direct you into the right program that will give you the exact information that you need and the one on one embroidery business guidance may not necessary at the time. What If You Don’t Even Know The Right Questions To Ask? This is completely natural for many new embroiderers. In fact, many times my clients have no idea where to begin. After filling out the application I will know exactly how to help you and together we will completely fill in the blanks. This is not a spectator sport! It is going to take work on your part and I will be giving you the step by step embroidery business guidance to show you how to build your business. Together we will create a plan to help you go through the next step.